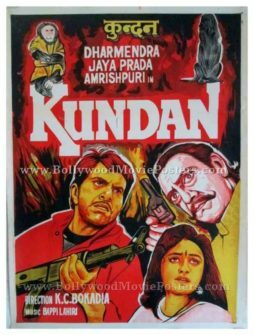 Hand drawn Bollywood poster of the classic Hindi film, Kundan (1993) for sale. 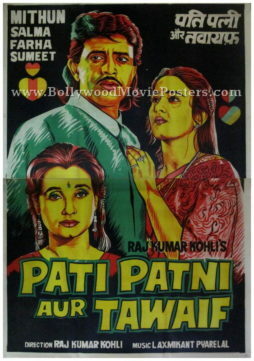 This is an actual surviving classic hand drawn movie poster of the 1993 Hindi film that starred the He-Man of Bollywood Dharmendra in the lead role opposite Jaya Prada. This hand drawn Bollywood poster was originally created on canvas by a small time art studio in Kolkata, giving it a very quirky appearance. Bright shades of red and yellow have been used in the design of this quirky hand drawn Bollywood film poster. Interestingly, the two animal stars of the film – a monkey and a dog – are also hand drawn on the top of this old hand drawn movie poster.